A 5.6-acre business park in central Calgary will be converted into industrial condos by Vancouver-based developer PC Urban Properties Corp. The company plans to renovate two aging industrial buildings, comprising 111,000 square feet, into a refurbished business park where companies can own their own spaces. Core Business Park, in the Burns Industrial Park area of the city along 58th Avenue S.E., and Blackfoot Trail, is currently fully leased. Existing tenants will be given the opportunity to convert to an ownership position, while other units will be sold to new businesses and investors. PC Urban bought the property from Morguard for just over $16.1 million last year. Brent Sawchyn, principal at PC Urban, said this is a rare opportunity in Calgary for businesses to invest in their own commercial property. PC Urban has had success in Metro Vancouver and in Kelowna selling industrial condos and Sawchyn it thinks there is also a market in Calgary. “It’s always wise within real estate to buy good property that’s well located,” said Sawchyn, adding this site provided an ideal location for PC Urban to pursue its development plans. “For a lot of the people, we believe ownership of industrial condominiums for small and medium-sized businesses (is attractive) for those people who live pretty close by. According to Cushman & Wakefield, the overall vacancy rate for industrial real estate in Calgary was 7.9 per cent at the end of 2017. The units at Core Business Park are being converted for end users, existing businesses and investors. Tenants who do not want to purchase have the option to leave at the end of their lease or enter into a new lease. These units will then appeal to an investor looking for cash flow, said Sawchyn. Sean Ferguson, associate vice president of industrial sales and leasing for Cushman & Wakefield, which is marketing the property, said there is a very limited supply of inner-city resale condos in Calgary. Most of the industrial condo product is either newly-developed and sold as a shell, without an office, or on the periphery of the city. Ferguson said the location of Core Business Park is a key – close to Macleod, Blackfoot, Glenmore and Deerfoot Trails as well as quick access to the CF Chinook Centre mall, the Deerfoot Meadows shopping centre, Calgary International Airport and Calgary’s downtown. Units can range from just over 4,200 square feet to just over 18,000 square feet. Pricing will be between about $230-$245 per square foot. “We can do larger contiguous units than that even. So there’s some variety in what we can offer as well . . . We could go up to 55,000 square feet if somebody wanted to buy an entire building,” said Ferguson. There are 13 existing tenants in 24 units. “The existing tenants will all be given an opportunity to purchase. We’re seeing strong interest from the owners just based on location and what PC Urban is going to do with regards to capital expenditures to improve the building,” he said. Renovations are to begin by this summer with completion by early 2019. Aaron Bell, CFO of Alberta Breaker and Supply Co., has leased space in the existing park for about seven years selling new and used circuit breakers. “(Buying a condo) is something that we would definitely be interested in. This particular location is a central location, close to all of my competitors and most of my competitors are also my customers,” said Bell. “There’s also quick access to main arteries and it’s a short ride over to downtown from here. A renovated Core Business Park will include a modernized facade with architectural accent features, new office doors and windows, individualized entry portals, a consistent signage program and exterior lighting upgrades. The layout of each unit offers easy loading capacities, with small bay sizes and a mix of dock and drive-in loading doors. There are large external maneuvering areas and rear storage opportunities as well as ample double parking. 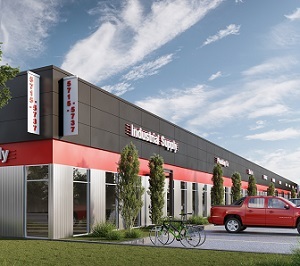 PC Urban has been active in the Calgary market in the retail sector, but this is its first foray into industrial property in the city. It has extensive experience developing industrial parks in Vancouver, with future developments forthcoming in Kelowna and other Western Canada locales. Its first commercial strata development, Barrow Street, was in North Vancouver. That was followed quickly by IntraUrban Laurel, IntraUrban Rivershore and IntraUrban Enterprise. In both Vancouver and Kelowna, the new builds are to be the first commercial strata offerings within city limits in many years. In Vancouver, units sold out before construction started, highlighting the need for ownership opportunities for the city’s small and medium-sized businesses, PC Urban says. Sawchyn said 65 to 75 per cent of the company’s overall business is industrial development. It also has some boutique office space in the Vancouver area and some multi-family and retail real estate.